As both the capital city of modern Greece and the heart of classical antiquity, Athens is a city of layers-the new build upon the old in a blend of changing history and culture. Ancient sites like the Acropolis and Agora shine through as prime examples of the past, while the bustling Plaka and other modern neighborhoods serve as hubs of present-day culture. From tavernas and eateries overflowing with customers to shops filled with tapestries, knick knacks, jewelry, and more, Athens is a center of activity. The main tourist streets are often filled with performers and musicians, and the commotion continues at night with restaurants and bars open into the late hours. Much of Greece is like this-bustling and busy, except for afternoon siesta hours when many places close for the afternoon until the evening hours around 6 or 7 PM. Being a metropolitan hub and tourist destination, much of Athens; however, especially the Plaka, will remain open during siesta. Generally, spring and fall are the best times to visit if you wish to avoid the heaviest tourist crowds. The summer is incredibly hot and dry and brings in the vacation crowds, while the winter can bring rain and sometimes snow. If you are looking to save on money; however, the low season of winter can offer you the best prices of the year while avoiding the peak season crowds. For more details on finding the best time to visit to suit your needs and interests see Greece Travel Expert Matt Barrett's suggestions here. Just like any metropolitan area, Athens has plenty of options when it comes to places to spend the night. Airbnb lists accommodations for as low as $20 per night to as much as $4,000 per night, depending on how many guests and the kind of space you are looking to rent. On average, hotels in Athens fall in the $80-$90 range, though you can definitely find lower or higher prices, again depending on the number of guests and type of accommodations. Most average hotel rooms have twin beds, either separated or pushed together to create a double. Showers are generally small and have movable showerheads on a hose. Some hotels offer rooftop views of the city and the Acropolis, and some include breakfast. Typical hotel breakfast includes of buffet of items like Greek yogurt, honey, dates, cold deli cuts, tomato, cucumber, cheeses, hard boiled eggs, fruit, coffee, and juice. A few of the most highly rated and affordable hotels in the city center include the Athens Lodge Hotel, Palladian Home Hotel, Nefeli Hotel, Acro & Polis Hotel, Hotel Acropolis House, and Athos Hotel. For the cheapest options, hostels in Athens cost about $16 ($4-$25) for a dorm and $35 ($20-$55) for a double private room. Additional hostel information and pricing can be found by exploring the links below. Athens International Airport is the largest airport of the Greece mainland and is served by most major airlines. If traveling internationally, the cheapest way to reach Athens is to search for the most inexpensive flight to a European country (via Skyscanner or another travel search engine), and then book a separate connector flight to Athens. Once you've got your flight to Europe booked, there are plenty of low-cost airlines (like Ryanair) that make it easy to country-hop right on over to Greece. Plus, it's a great way to get a quick sampling of another European country if you happen to have a longer layover. Keep in mind that flight search engines are great for comparing prices as far as finding the cheapest locations, dates, and days of the week; however, when you are ready to book you probably won't find any cheaper than directly from the airline itself. Do your research with the search engine; buy through the airline. Some airlines also offer coupons, holiday specials, and other discounts if you sign up for their emails. Once you've reached Athens, you will find that it is a central hub for transportation. Here visitors have access to the metro from the airport to many other parts of the city, as well as KTEL bus services to nearly every popular attraction on the mainland. Rental cars and taxis are also available. The metro has three lines. Line 1 (green line) travels between Kifisia and Piraeus, Line 2 (red line) between Anthoupoli and Eliniko, and Line 3 (blue line) between the Airport, Doukissis Plakentias, and Aghia Marina. Yellow Trolleys and Blue Buses can also take you anywhere in the city and in the suburbs, though the metro is probably the quickest and easiest way to navigate. A basic ticket is about €1.50 and is good for any means of transport with transfers for 1.5 hours, a 24-hour ticket will be about €4.00, and a week-long pass will be around €10.00. Just southwest of Athens, the port of Piraeus offers passenger boats and ferries to nearly any of the islands as well as other locations on the mainland. For ferry tickets, try Ferries in Greece. Or check out this full-day cruise from Get Your Guide, traveling from Athens to Poros, Aegina, and Hydra. See additional information on tours and cruises below. For another way to access the sea from the city, the Athens Coastal Tram goes from Syntagma Square to the Beaches of Glyfada and Voula with stops in Nea Smyrni and all along the coast. Dating to classical antiquity, Athens has seen many centuries of history, which are showcased in its museums, archaeological sites, and architecture. With its foundations as an ancient city, before motorized transportation, the oldest parts of Athens can be easily navigated on foot. There are also hop-on-hop-off services, like the Happy Train or open-roof double decker buses, which take visitors to the most popular city sights. 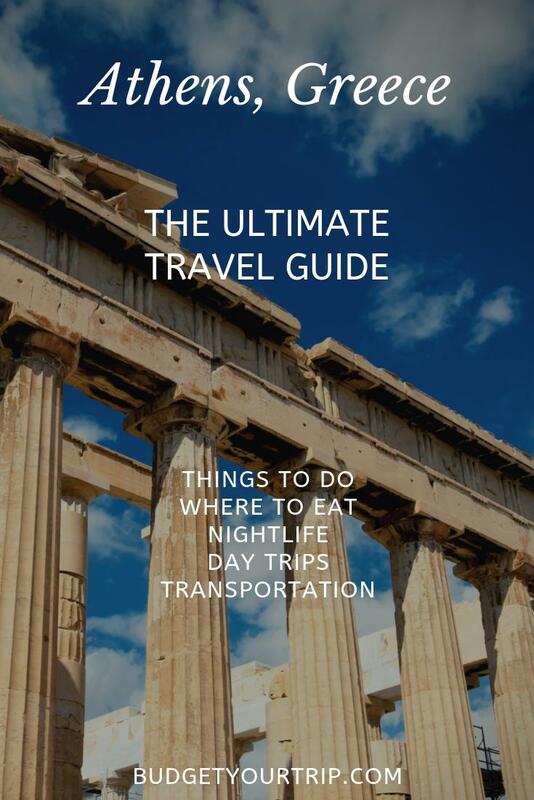 For additional tours and sight-seeing options see the Athens list from Get Your Guide. Tickets to the main attraction historic sites of Athens can be purchases individually or as a package deal for about €20. The package must be used within a week and includes entrance to the Acropolis, Ancient Agora, Theatre of Dionysus, Kerameikos, Roman Agora, Tower of the Winds, and the Temple of Olympian Zeus. Students, youth under 18, and senior discounts are also available. The most famous of these sights is, of course, the Acropolis. Located on a rocky hilltop overlooking all of Athens, the Acropolis and its monuments stand as world-renowned examples of classical antiquity, significant in many ways to many people-historically, architecturally, and spiritually, amongst others. The centerpiece of this ancient citadel is the Parthenon, a temple dedicated to the goddess Athena, patron of Athens. It stands alongside other important structures like the Temple of Athena Nike (a.k.a. the Erechtheion) and the Old Temple of Athena. You can find a variety of guided tours of the Acropolis and its monuments here. Also, it's important to do a little research before visiting on your own, so here's a list of things to know before visiting the Acropolis in Athens. In addition to the architectural accomplishments of the ancient Athenians, the Acropolis is also an unbelievable spot to see all of Athens from a God's point of view. Depending where you are standing on the hilltop, a unique view of the city below awaits. From the northeast corner, for example, just below the Greek flag, you can see a wave of ceramic tile roofs sprawled below leading to the base of the hill where you'll gaze upon the ruins of the Temple of Olympian Zeus, and beyond that, the Olympic Stadium. From another point of view you'll look down and see the Theatre of Dionysus, from another you'll see the adjacent Mount Lycabettus, from another the Odeon of Herodes Atticus where concerts are still held today, and from another you might even see all the way down to the port of Piraeus where Greece meets the sea, especially on a clear day. Once you've seen Athens from above, in the company of the city's most iconic landmark, there is still plenty of historic sight-seeing to be had down below. Right at the base of the Acropolis is the Theatre of Dionysus, where you can strike a pose or take a seat on what is considered to be the world's very first theatre. Venture further down and you can also stand in the presence of the Temple of Olympian Zeus or the Arch of Hadrian. There is even an active archaeological site, known as the Ancient Agora of Athens, where you can visit other important structures of antiquity, such as the Temple of Hephaestus and the Stoa of Attalos, as well as many other impressive examples of Athenian engineering. 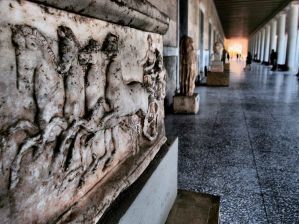 The Roman Agora offers another step back in time to the period of the Roman Empire. The entrance gate, known as the Gate of Athena Archegetis, is inscribed with a note indicating that Julius Caesar and Augustus provided the funds for its construction in the 1st century B.C. Within the agora, you'll see remnants of a courtyard surrounded by grand colonnades, fragments of what was once mosaic flooring, and the octagonal Tower of the Winds, which has personifications of the eight winds carved on each side, amongst many other ruins. For a peek into the daily life of an even older civilization, you can also visit Kerameikos. This portion of Athens gets its name from keramos, meaning "pottery clay," from which the English word "ceramic" is derived. Later becoming the home to potters' workshops, the site actually served as an organized cemetery starting as early as 1200 BC. These layers of time are evident as you walk through the archaeological remnants that have been uncovered at the site today. In addition to the city's many archaeological and architectural landmarks, Athens is host to a handful of museums that offer deeper insights into the artifacts and detailed histories of each location. Some of the museums even house collections from greater Greece dating pre-history to late antiquity, as well as from the Ottoman, Byzantine, and Roman Empires. For many of the museums, package deals are available. The most popular package is a three-day ticket valid for the National Archaeological Museum, Epigraphic Museum, Numismatic Museum, and Byzantine and Christian Museum of Athens for €15 per person, or €8 reduced. See individual descriptions below for detailed ticketing information. Acropolis Museum: Once you've stood on Athens' renowned hill and have taken in all the glory of the Parthenon and its accompanying structures, head over to the Acropolis Museum. This museum focuses on the archaeological findings of the sacred site. Anything that was found on the slopes of the Acropolis is housed in this museum-from objects used by Athenians in everyday life to sculptures and carvings from the Parthenon itself. Other exhibits include artifacts from the Propylaia, Athena Nike, and Erechtheion. General admission is €5 in winter and €10 in summer with reduced fees available for students from non-EU countries, people under the age of 18 from non-EU countries, and senior citizens from Greece and EU countries (must show ID for all). See details for reduced or free admission here. Get Your Guide is also offering an Acropolis Museum Skip-the-Line Ticket as well as a variety of guided tours. National Archaeological Museum: Known to house one of the richest collections of Greek artifacts worldwide, the National Archaeological Museum showcases important objects from all over Greece, dating from prehistory to late antiquity. Some of the top attractions of the museum include the Kore and Kouros statues (550-540 BC), Zeus or Poseidon statue (460 BC), the Antikythera Mechanism (150-100 BC, thought to be the world's first computer), and the gold death mask of Agamemnon (16th century BC). Admission to this museum is €5 in winter and €10 in summer with reduced fees available for students, young people under 18, and seniors. Visitors also have the option to purchase a three-day ticket valid for the National Archaeological Museum, Epigraphic Museum, Numismatic Museum, and Byzantine and Christian Museum of Athens for €15 per person, or €8 reduced. See additional ticketing details here. Get Your Guide also offers a 60-minute Smartphone audio tour, as well as a 1.5-hour group guided tour. Epigraphic Museum: Housed in its own wing of the National Archaeological Museum, the Epigraphic Museum is host to a collection of over 14,000, mostly Greek, inscriptions. It is also a facility for ongoing research, so only the courtyards, lobby, and four rooms are open to the public. Tickets are €2, or can be purchased in a package deal with the National Archaeological Museum, Numismatic Museum, and Byzantine and Christian Museum of Athens for €15 (€8 reduced). See details for reduced or free admission here. Numismatic Museum: Home to one of the greatest collections of ancient and modern coins worldwide, the Numismatic Museum of Athens exhibits hoards from the Byzantine Empire, Ottoman Empire, and Hellenistic and Roman periods. The museum also houses a library of 12,000 books specializing in the study of coinage, as well as a conservation laboratory. Tickets are €6 with a €3 reduced fee available for students, young people under 18, and seniors. Visitors can also purchase the €15 (€8 reduced) package deal, which is valid for the Numismatic Museum, National Archaeological Museum, Byzantine & Christian Museum, and Epigraphic Museum. See ticketing details here. Byzantine and Christian Museum: With more than 25,000 artifacts, the Byzantine and Christian Museum of Athens has a large and varied collection of religious artifacts of the Early Christian, Byzantine, Medieval, post-Byzantine, and later periods. General admission is €4 with free or reduced fees available, as well as a €15 (€8 reduced) package deal valid for the Numismatic Museum, National Archaeological Museum, Byzantine & Christian Museum, and Epigraphic Museum. If you're interested in the Christian history of Athens, Get Your Guide offers a 4-hour Athens Christian Tour, which includes a visit to the museum. Museum of Cycladic Art: This museum is home to a notable collection of artifacts of ancient Greek and Cycladic art, belonging to Nicholas and Dolly Goulandris. It has also hosted temporary exhibitions of some of the most important Greek and international modern and contemporary artists. Regular admission is €7, Monday tickets are €3.50, ages 19-26 are €2.50, seniors and university students are €3.50, and groups (over 15) are €5 per person. Learn more about the museum here. Benaki Museum: Housed in the Benakis family mansion in downtown Athens, Greece, the Benaki Museum is home to a collection of Greek art from prehistory to modern times, an extensive collection of Asian art, and temporary exhibits. The museum also has some satellite museums, which include Benaki Museum of Islamic Art in the Kerameikos district, the Nikos Hadjikyriakos-Ghikas Gallery in downtown Athens, the Benaki Museum Pireos street Annex (138 Pireos street), and the Penelope Delta House in Kifissia, which houses the Historical Archive Collection. Full admission is €9, or €7 reduced. See additional ticketing details here. Though the most famous of Greece's beaches reside on island shores, mainland Greece also has a stretch of beachfront known as the Apollo Coast, which begins in the Athens neighborhood of Piraeus. There are plenty of resort hotels that allow for easy access to Athens, while also enjoying some beach time; however, the further you get from the city, the nicer the beaches will be. A visit to Greece is your chance to dip your toes into the Mediterranean Sea! From Glyfada to Varkiza, Athens has several pay beaches with amenities like cabanas, snack bars, showers, cafes, and restaurants. 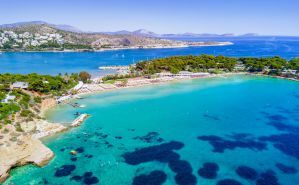 Vouliagmeni is probably the most popular of these beaches. Generally, beaches access will cost about €8 - €10 per person, sometimes costing extra if you wish to use an umbrella and lounge chair. Costs vary depending on the popularity of the beach and access to amenities; however, there are some free options available as well. A number of small pebble beaches known as The Coves are located between Vouliagmeni and Varkiza. Since they are free to the public they can get crowded during tourist season, but the lack of sand is great for snorkeling. Other beaches, like Saronida and Anavissos, are popular for windsurfing. Sounion offers a beach at the base of the Temple of Poseidon, while Daskalio is more remote requiring a car to get there. Each of these beaches also has easy access to tavernas for beachside dining. There are countless other beaches along the coast, best reached by renting or hiring a car. National Garden: Covering about 15.5 hectares at the center of Athens, the National Garden is beautifully designed with native and exotic plants, archaeological ruins, and a children's library-all located right behind the Parliament building. Zappeion: Now used primarily as a conference center for meetings and ceremonies, the Zappeion was originally constructed in the 1880s for the first modern Olympic Games-then known as the Kalimarmaro Olympic Stadium of the 1896 Olympic Games. It is located at the heart of Athens in the National Garden. 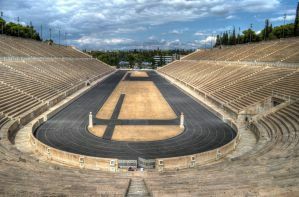 Panathenaic Stadium: Another important structure for the first modern Olympic Games of 1896, the Panathenaic Stadium today hosts a variety of events and live concerts. It is also the only stadium in the world built entirely out of marble. Mount Lycabettus: A landmark hill visible from most of Athens, Mount Lycabettus is marked by a unique dark base of pine trees with a limestone outcropping. Visitors can take a cable car to the top to enjoy panoramic views of the city, the 19th-century Chapel of St. George, a theatre, and a restaurant. Areopagus: Another rocky hill located near the Acropolis, the Areopagus has a long history serving as a court for trying crimes in classical times and was the site of a famous speech by Saint Paul in 51 AD. Hadrian's Library: Located at the base of the Acropolis near Monastiraki Square, the site known as Hadrian's Library encompasses Roman ruins of a library and cultural complex constructed in 132 AD by the emperor Hadrian. 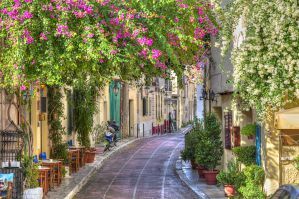 Plaka is the oldest historical neighborhood of Athens, a labyrinth of lively alleyways clustered at the base of the Acropolis. Developed around the ruins of the Ancient Agora, this area was where ancient life was centered, and is probably the busiest hub for tourist activity today. 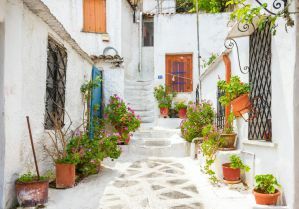 Adrianou Street (running north and south) is the largest and most central street in Plaka; however, there are many winding streets to explore in this area lined with souvenir shops and taverna restaurants. 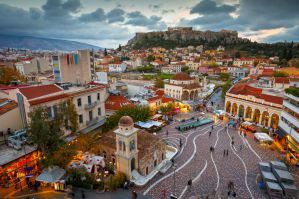 Monastiraki is centered on an open cobbled area known as Monastiraki Square, which is bordered by a Greek Orthodox Church, Flea Market, Metro Station, and the ruins of Hadrian's Library. In the evenings you will likely find street performers entertaining in the square. 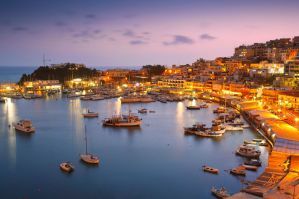 From this central location, the surrounding streets are packed with traditional tavernas, restaurants, and souvenir shops. You can also pick up the Happy Train mentioned earlier from the corner Hadrian's Library ruins closest to the Acropolis-just look for the queue sign. Thissio is located right beside the Monastiraki neighborhood and is best known for its trendy shops and cafes. It also provides access to a wide pedestrian walkway that is often lined with street vendors and leads right to the Acropolis Museum. Syntagma Square (or Constitution Square) is located at the center of modern Athens, facing the Greek Parliament building. It is one of the largest squares in Greece with easy access to metro, bus, or taxi services, and is the starting point of Ermou Street, a hub for retail shopping. Nearby, behind Parliament you will also find the National Garden and Zappeion. Psiri, though it is not as popular with tourists, is another center for tavernas, cafes, bars, and shops. 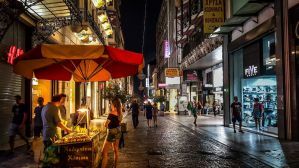 With a blend of traditional and modern character, this area of the city is especially popular with young Athenians, making it a great place for experiencing the local nightlife of Athens. Kolonaki is one of the most upscale neighborhoods of Athens. It is characterized by its charming cafes, chic boutiques, and elegant restaurants, which make Kolonaki a pleasant area to experience the wealthier side of the city. Gazi (meaning gas) is the industrial area of Athens, taking its name from a former gas factory of the district, which is now used as a cultural center hosting many concerts and special events throughout the year. Today it is also known for its nightclubs and restaurants, and is located near the Keramiko metro station. Piraeus is the natural port of Athens, located about 10 kilometers southwest of the city center. It is the starting point for all boat traffic to the Greek islands, abundant with ferry kiosks and travel agencies for booking your sea travels. Most visitors are mainly concerned with the port area, which also has plenty of shops, cafes, restaurants, and bars for entertaining tourists as they wait for their ferries. On the opposite side of the peninsula, there is another port known as the Zea Marina, mainly for private yachts. Omonia Square is another large square in central Athens. Though it is sometimes difficult to access due to traffic, it is a popular performance space for young artists, and has many people coming and going daily with its direct access to the metro station. Athens and its surrounding day-trip attractions can be easily visited and explored at your own pace, but if you prefer a more guided experience, there are plenty of tours operating in and around the city. Some packages cover the basics of the most sought-after attractions, while others delve deeper into specialties like food, wine, history, art, architecture, islands-you name it! Below are some tours from Get Your Guide to get you started. Athens Wartime History Tour: Explore Greek military history from ancient times through the two World Wars. Athens 6-Hour History Tour: Visit the most popular sites around Athens, including the Acropolis, Temple of Olympian Zeus, Panathenian Stadium, Changing of the Guards at the Greek Parliament, University of Athens, Plaka, and more. Athens: Private Walking Tour: See the most famous landmarks in Athens on a 4-hour walking tour; begins and ends at the Acropolis Metro Station. Athens: Acropolis, Plaka, Ancient Agora, & Agora Museum Tour: 4-hour walking tour, delving deep into the history of the Acropolis and Ancient Agora; great for history buffs! Athens: Full-Day Highlights Private Tour: Visit the major sites of Athens with a state-licensed guide; sites include the Acropolis, Parthenon, Erectheion, Temple of Athena Nike, Propylaea, Acropolis Museum, and Ancient Agora, as well as a pass by other Athens sights and neighborhoods. Athens Pottery Workshop: Make Your Own Greek Souvenir: A hands-on way to sample Greek culture by participating in one of the most ancient art forms-pottery. Athens Night Tour: 3 Hours by Segway: Tour the city by night, experiencing the evening atmosphere of illuminated monuments and hip nightlife neighborhoods, all by Segway. Athens Mystery Tour on Electric Trikke Bikes: Learn about the history of Athens through a fun, interactive game of clues and riddles; travel by electric Trikke bike, 2-hour duration. Athens Original Street Art Tour: Guided by a real street artist, learn all about the secret messages and art behind Athens' graffiti; 3-hour duration. Athens: 1-Hour Morning Activity Running Through History: See Athens from a different perspective, running on the ancient paths of Athens and through the alleys of the old town. Athens Christian Tour: See sites in Athens important to the history of Christianity, plus a visit to the Byzantine Museum; 4-hour duration. It is very hard to go wrong when it comes to food in Greece. If you are interested in traditional Greek fare, taverna-style eateries are concentrated in various neighborhoods around Athens. Places like these serve up Greek-Mediterranean fare full of herb-rubbed meats, fresh vegetables, tzatziki, fresh baked breads, and olive oil. Many of Greek's natives also brew their own beers, wines, and spirits. Nearly everything is made from scratch. Even the Greek fast food gyros are made with meat grilled and shaved right off the spit. Of course, if you happen to tire of the traditional cuisine, a city like Athens will have just about anything from burgers and pizza to other international options. Being a country of the Mediterranean, seafood is also always on the menu. Gyros, even though they are considered the fast food of Greece, are always fresh, filling, and hard to beat when it comes to price-usually as little as €2.00 per gyro (a solid, quick meal during a busy day of sightseeing). 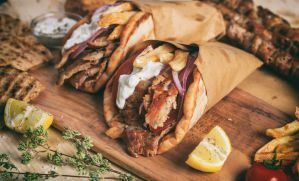 Unlike American gyros, true Greek gyros are served with French fries in the gyro itself along with the usual shaved meat, tomato, onion, lettuce, and tzatziki. Souvlaki-small pieces of grilled meat served on a skewer-are also a common fast food. These are great options for a quick lunch during a busy day of touring the city. Another refreshing favorite is horiatiki, or a typical Greek salad, complete with fresh tomato, cucumber, Kalamata olives, feta cheese, red onion, and green bell peppers all seasoned with oregano and olive oil. These are just a few favorites of a rich culinary heritage always practiced with the freshest ingredients. 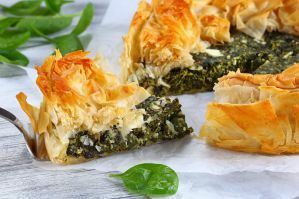 Other Greek favorites include items like spanakopita (spinach, cheese, feta), moussaka (eggplant, potato, ground meat), saganaki (fried feta cheese), baklava for dessert (nuts, honey, filo), and many others. 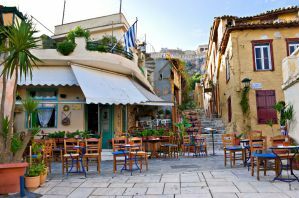 The Plaka neighborhood at the base of the Acropolis is an obvious choice for dining. Walking along its winding cobbled streets, you'll come across plenty of hosts trying to lure in customers to their tables. The atmosphere in this part of the city is probably the best, dimly lit tavernas twinkling in the alleyways emanating with the sounds of stringed instruments, Greek singing, and lively conversations-the Parthenon aglow on the hilltop overlooking it all. The food here will probably be the most expensive, but is generally affordable compared to other European cities. Don't be afraid to look at the menus for food and pricing, and don't feel bad walking away even with the insistence of the hosts or hostesses. Additional neighborhoods that will have plenty of options for dining include Psiri, Monastiraki, Kolonaki, and Gazi. For a great guide to restaurants around Athens, see some recommendations here. You can also find additional information on Greek food here. If you prefer a more guided experience of the city's culinary culture, try one of these food tours from Get Your Guide, or one of the tours listed below. 4-hour Greek Food Walking Tour: Includes culinary highlights of the Monastiraki District, food and drink tastings, one of oldest and best souvlaki houses in Greece, and one of the oldest Greek coffee houses. Traditional Greek Cuisine Cooking Lesson in Athens: For an immersive experience into Greek culture, this cooking class teaches you how to cook a traditional 3-course meal, which you will then enjoy at the end of the course with a wine tasting. 3-Hour Guided Tour of Traditional Greek Cuisine: Taste delicious, traditional food at 6 different bars and restaurants in the neighborhoods of Monastiraki, Psyri, and downtown Athens. Half-Day Ultimate Food Walking Tour: Explore the history of Greek gastronomy with a foodie expert, including 15 unique tastings important to local history and culture. Nemea and Nafplio: Wine and History Tour: The Nemea Region of the Peloponnese is known for its high quality Greek Agiorgitiko PDO red wine. This tour includes a visit to two wineries with premium tastings and an introduction to wine production in the region with a cultural visit to the old city of Nafplio, the original capital of Greece. Full-Day Aigialeia Wine Tour with Lunch: See beautiful canyon scenery as you ride the train to learn about the history of the Kalavritan holocaust, visit a wine-producing monastery, enjoy a lunch and wine pairing, and tour. Private Tasting Tour of Greek Wine: Enjoy a 2-hour private tasting experience, visiting one of Athens' premiere wine bars; includes 4 tastings paired with sweet and savory local delicacies, along with a parting gift. Wine Tour and Lunch in a Seaside Tavern: Visit two iconic wineries in the Mesogeia geographical region of Attica; includes tours and tastings, as well as lunch at a seaside fish tavern. Three things often occupy metropolitan nightlife-food, drinks, and entertainment-and Athens has no shortage of the three. As the sun goes down and you embark on your evening stroll, the streets of Athens come to life with romantic lighting, music of all varieties, and the chatter of good times being had at every corner. There is no set definition of what a great night on the town entails, but Athens is host to an assortment of neighborhoods to suit all tastes and preferences. To get you started, you may want to become familiar with some of the local drinks. Of course, Athens will have a wide variety of familiar drinks as well, but if you want to try some traditional options, we will introduce a few here. 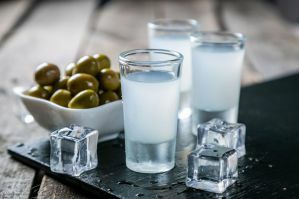 Ouzo, of course, is one that most people have heard of, as it is considered to be the national drink of Greece. It is a dry, anise-flavored alcohol often served chilled or with ice to accompany mezedes, or "small plates." While it is most commonly consumed straight, there are also a handful of ouzo cocktails, such as the "ouzito," which consists of ouzo shaken over ice with crushed mint leaves, lemon juice, and sugar-a Greek spin on a mojito. Raki, Tsipouro, and Tsikoudia all refer to the same drink. A sort of "Greek moonshine," it is strong and alcoholic in flavor and is distilled from the pomace, or leftover skin and grape seeds, of the wine press. Most often it is served in shot glasses, chilled or at room temperature, with small plates or appetizers. Another specialty to Greece is a white wine known as Retsina, named for being flavored with the resin of evergreen trees, which gives the drink a distinct pine flavor. It is said to have originated from storing the wine in wooden barrels and sealed with resin. Today the flavor is added for authenticity, and it is best served chilled. For the beer enthusiasts, there are a few Greek brews also worth trying. Alpha is the oldest of the brands, a traditional Greek lager with light gold color and rich foam. Piraiki is brewed at the port of Piraeus and comes in Pils or Pale Ale. Mythos is one of the most popular brands in Greece, a pale lager with a refreshing taste. Other favorites include Fix (pale lager), Vergina (premium lager), Zeos (black Weiss, pilsner, and lager), Neda (lager with hop aroma and spicy taste), Septem (bitter taste), Harma (unfiltered lager), and the beers of Corfu Brewery (four varieties). Moving on to nightlife entertainment, Athens is host to just about anything-including classical music orchestras, ballets, an assortment of today's popular musical artists, discos, clubs, and traditional Greek musicians. Anything from a stadium rock concert to a dinner serenade, Athens has it all. 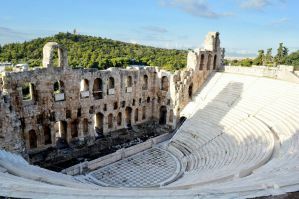 Artists such as the Rolling Stones, Bruce Springsteen, and Pink Floyd have played the Olympic Stadium, while classical, ballet, and theatre shows can be found at the Herod Atticus Theatre next to the Acropolis. Other performance venues include the Lycabettos Outdoor Theater on top of Lycabettos Mountain, the Megaron concert hall for music and dance, and the Badminton Theatre (a former Olympic building). If a big concert is happening in Athens, it's easy to find out just by looking at posters hung around the city. If not, there is still plenty of fun to be had in the tavernas and ouzeries that often play live traditional music, or even the bars and nightclubs that offer a more contemporary music scene. This being said, it is helpful to know what neighborhoods suit your nightlife needs. See if any of the areas listed below meet your match. Psiri is one of the neighborhoods of the young and hip, especially for local Athenians. Here you will find plenty of bars and nightclubs playing music that ranges from Greek, rock, and ethnic to Latin, pop, and jazz. As far as bars go, many people recommend checking out the wine selection at Barrett, cocktails at Boiler, and beers at Six d.o.g.s. Gazi is currently the trendiest neighborhood for nightlife with its industrial vibe as well as many art galleries, mainstream bars, restaurants, and clubs, some of which feature live Greek pop singers. One of the more popular clubs here is called LOHAN, established by actress Lindsey Lohan with a business partner. It features some of the best DJs with all the special effects of lighting, fog, and confetti. Exarchia offers another younger crowd with an urban hipster vibe. It is less of a clubbing area and more of a bar haven, known for its food and arts scene. Many of the haunts in this neighborhood are small and intimate, but vibrant with plenty of options to enjoy music on the casual side. Patsion is a neighborhood known mainly to locals, with bars that are unassuming on the outside but lively on the inside. It is also home to the city's oldest bar, Au Revoir, which dates back to 1958. Here you'll find intellectuals, writers, and students, all smoking and enjoying a variety of traditional aperitifs and cognacs. Koukaki, located near the Acropolis, is a great neighborhood for the more sophisticated bars, especially for enjoying drinks after a long day of sight-seeing. This area can be described as having an artsy urban village atmosphere. Kolonaki is another neighborhood for the more sophisticated side of Athens nightlife. Here you will find a number of more intimate cocktail bars as well as chic nightclubs. You might try a bar called Jazz in Jazz if you enjoy jazz or blues music as you drink. Delphi is one of the most famous archaeological sites of the mainland. Proclaimed to be the center of the world by the ancient Greeks, Delphi and its ruins exist on the sloping mountainside of Mount Parnassus. With breathtaking views just over the cliffs, one cannot help but marvel at the sweeping valley dotted with olive trees all the way down to the sea. Home to the legendary Oracle of Delphi and sanctuary to the god Apollo, the worn stone and marble of the site was once a hub of civilization and cultural activity. Some highlights of Delphi include the Temple of Apollo, Athenian Treasury, Rock of the Sybil, a stadium, theatre, and other ancient ruins. Nearby, you can also visit the Temple of Athena Pronaia, and don't forget to spend some time at the Delphi Archaeological Museum for a deeper insight into the history and artifacts found in the area. From Athens, the drive is about 2 hours and 20 minutes. Get Your Guide also has various guided day trips to Delphi. On the way to Delphi, you might also consider stopping at the mountain village of Arachova. Nestled into the base of Mount Parnassus, Arachova is most popular as a wintertime skiing destination; however, it is a charming place to visit year-round with expansive views of the valley, quaint cobbled streets, iconic bell tower, and a maze of interesting alleyways and architecture. It also has a bustling nightlife, many beautiful Byzantine churches, and is well-known for its colorful hand-woven carpets and rugs. Since it is only about 15 minutes from Delphi, the village can be easily seen on the way from Athens. The famous Hosios Loukas Monastery is also nearby. Designated as one of UNESCO's World Heritage Sites for its Byzantine art and architecture, the monastery is also worth a visit on the way to Delphi. If you get an early start, these sites can all be seen within a day's trip from Athens. A few hours further north, some of the most important cultural sites of the mainland are the monasteries of Meteora. They sit at the tops of gigantic natural sandstone pillars of rock, jutting of the landscape like meteors from the sky. While only 6 of the original 24 monasteries still remain, each have areas open to the public to be explored and admired by visitors. The Meteora monasteries have been included in the UNESCO World Heritage List, offering spectacular views in addition to the rich history, geological wonder, and culture that exists in the monasteries today. The village of Kalambaka, at the base of the monasteries, is located about 4 hours from Athens. You can rent a car and travel on your own schedule, or, book one of many excursions and guided tours available from Athens. Here is a list of options for single-day and multi-day trips from Get Your Guide. If you prefer to stay closer to Athens, another day trip option is to sample some of the sites of the eastern Peloponnese. From Athens, Corinth is just about an hour west. Here you can see the famous Corinth Canal, the ruins of the ancient city (about 7 kilometers southwest of the modern city), a museum, and spectacular views from the fortress of Acrocorinth. Once you've explored Corinth, the ancient citadel of Mycenae is just another 45 minutes southwest. An important center of Mycenean civilization during the Bronze Age, this archaeological site is known for the tomb of Agamemnon and the citadel ruins, including its famous lion gate. From here, the port town of Nafplio is just another 30 minutes south. With two historic fortresses (one at sea level and one about a thousand steps up a clifftop) and plenty of options for shopping, dining, hotels, and museums, Nafplio has just about everything you could ask for in a historic seaport. You can even try the wine and history tour, available from Athens, if you'd like to spend an entire day at the seaside port. From Nafplio, the ancient Epidaurus Theatre is another 30 minutes east. Dating back to the 4th Century BCE, it is considered to be the most perfect ancient Greek theatre in acoustics and aesthetics. It is said that you can hear a coin drop from the very top row of the stadium, which seats 13,000 to 14,000 at maximum capacity. The drive back to Athens from here is about 2 hours. While each of these sites are divided by short drives, they all have much to see and it may be worth a trip of a few days to really experience it all. Rent a car to explore at your own pace, or try one of these combination tours. Cape Sounion sits at the southernmost tip of Greece's Attica peninsula, overlooking the Aegean Sea. Atop crashing waves and towering cliffs, the Temple of Poseidon looms above it all. Dedicated to the Greek god of the sea, the temple is most popular to visit at sunset when the sun is swallowed by the Aegean Sea. This promontory and temple are very significant to Greek mythology and history, and was even referenced in Homer's poem, The Odyssey. See if you can spot ancient graffiti as you admire the temple, including a famous engraving by Lord Byron. Beyond the temple, there are a number of beaches in the area, the most popular situated at the base of the temple cliff. While the Aegean Beach Hotel does control about 90% of the beach, the water here is clear and beautiful and no one will stop you from laying out a towel on the beach's edge. If you would like to use the hotel's umbrellas or chairs there will be a small fee. Sounion is also one of the most expensive areas in Greece, with the value of some homes exceeding twenty million euros. Hotel rates are also more expensive than most other places in Greece. This is one reason why Sounion might be worth a day trip rather than an overnight stay. 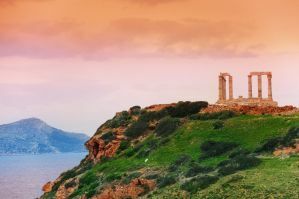 Rent a car to explore on your own schedule, or check out one of these Cape Sounion tours from Athens. A visit to Greece is not complete without experiencing life on its islands. While many of the most famous islands, such as Crete or Santorini are a lengthy ferry ride away, there are a few closer islands within the Saronic Gulf that offer a taste of the Greek islands without the long journey. The most popular of the closer islands to the mainland are Aegina, Poros, and Hydra. These are often grouped together in a day-cruise so you can experience a sampling of each. Some possible tours can be found here. 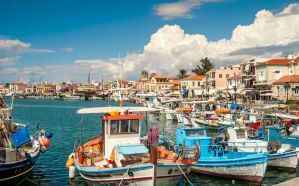 Located just off of Greece's coast, about 27 kilometers south of Athens, the island of Aegina can be reached by boat from Athens' port in Piraeus. With a countryside full of pistachio tree orchards, sweeping views of the sea, beaches to swim on, and archaeological ruins and a museum to explore, Aegina has a world of things to do to occupy your visit. There are also plenty of hotels and restaurants to choose from if you plan on extending your visit. Just south of Aegina, you can then visit the island of Poros. Like Aegina, this island has beaches and ruins to explore, as well as an iconic clock tower where you will find beautiful sunset views. Other highlights of Poros include an archaeological museum, a historic monastery, and of course plenty of Greek dining options. The island of Hydra is located another short boat journey south of Poros, between the Saronic and Argolic Gulfs. Named for its natural springs, the island now has most of its freshwater imported from the mainland. The real gem of the place is the absence of motorized vehicles. Cars and scooters are nowhere to be seen along the island's narrow marble-cobbled alleys. Such vehicles have been outlawed and so the way to navigate the island is by donkey, water taxi, or on foot. Most restaurants and hotels are concentrated near the port, so you won't need to go far. As soon as to step onto the island, you will be approached by locals offering their hotel and donkey services. Beaches are best reached by boat taxi, though you can also walk along a path that circles the island. 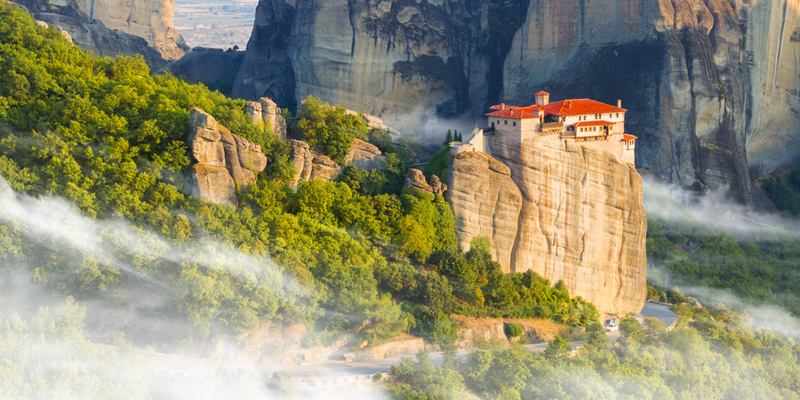 From Athens: 2-Day Rail Tour to Meteora: Meteora is world-renowned for its cliff-top monasteries, cultural importance, and natural beauty. This tour includes a round-trip train ride to the village of Kalambaka, overnight hotel stay with breakfast and dinner, and a tour of Meteora. Athens & Cape Sounion Private Sightseeing Tour: See the best of Athens with a professional guide, plus a scenic drive to Cape Sounion where you will visit the famous Temple of Poseidon. From Athens: Mycenae, Epidaurus & Nafplion Private Tour: Stop by the Corinth Canal, explore the ancient kingdom of Mycenae where Agamemnon's tomb resides, experience the acoustics of the Ancient Epidaurus Theatre, and wander the charming streets of Nafplio. Tour begins and ends in Athens. 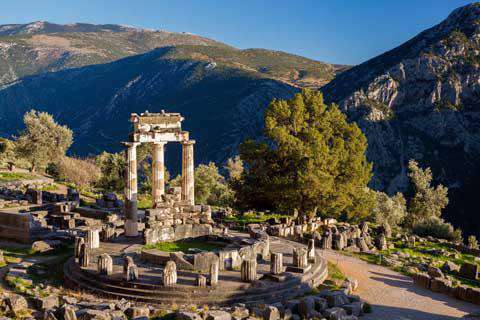 Delphi Full-Day Tour from Athens: Leave from Athens, stopping at Levadia and Arachova (known for colorful woven rugs), before reaching Delphi at the foot of Mount Parnassus. Here you will enjoy stunning mountain scenery, ancient ruins, and a visit to the Delphi Museum. 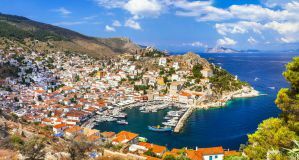 From Athens: Full-Day Cruise to Aegina, Poros and Hydra: For a quick taste of the Greek islands, this tour includes a day trip to Aegina, Poros, and Hydra in the Saronic Gulf with stops at each port, as well as food and entertainment provided on the boat. 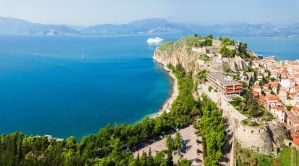 Corinthia and the Argolid: 3-Day Private Treasures Tour: Corinthia and the Argolid include important sites like Mycenae and Epidaurus, the Corinth Canal, Ancient Conrinth, and charming seaside towns. Spend 3 days exploring these sites on this tour, which includes transportation, hotel, guide, museum entries, and three 3-course meals. Athens: 5-day Sail the Cyclades Islands Tour: Visit and explore 3 Greek islands of the Cyclades group: Kea, Serifos, and Kythnos. The trip includes 4 nights' accommodation, 4 breakfasts onboard, 4 lunches onboard, 2 guided hikes with an expert hiking guide in Kythnos, 2 stand-up paddle boards, and Athens Airport transfers. 9-Day UNESCO Sites of Southern Greece: Itinerary includes (Day 1) Corinth Canal, Palaia Epidaurus, Ancient Epidaurus, Nafplio, (Day 2) The Mycenaean citadel of Tiryns and the renowned city of Mycenae, (Day 3) Mystras and Sparta, (Day 4) Apollo Epicurius at Vassae and Ancient Olympia, (Day 5) Ancient Olympia, (Day 6) Galaxidi, (Day 7) Delphi, (Day 8) Hossios Loukas, and (Day 9) The Acropolis of Athens and the New Acropolis Museum. The excursion also comes with an expert guide, transportation, 9-night overnight accommodation, breakfast, entry fees, 9 meals, and bottled water during tours. When visiting a country where English is not the mother tongue, it is useful to have a few common phrases up your sleeve. In a city like Athens most people will speak English, but the locals still appreciate the effort if you're willing to learn a little Greek. Below are some useful phrases, spelled phonetically with pronunciations and translations. - Ti kanis (Tee-KAH-niss ) - How are you? - Poso kani afto (POH-soh KAH-nee af-TOH) - How much is it? - Milate aglika (Mee-LAH-teh ag-li-KAH) - Do you speak English? - Poi nay (Poh-EE-nay...) - Where is _____? Greece does use its own alphabet, so when you see the written language it will be unfamiliar. With the tips below you may be able to sound out some of the words you see written on streets signs or menus, though again, many things will have the English translation. For a more extensive guide on pronouncing the Greek alphabet click here. - Β, β - pronounced like the letter "V"
- Λ, λ - pronounced like the letter "L"
- Μ, μ - pronounced like the letter "M"
- Ν, ν - pronounced like the letter "N"
- Χ, χ - pronounced like the letter "X"
- Π, π - pronounced like the letter "P"
- Ρ, ρ - sounds like a rolled "R"
- Σ, σ, ς - pronounced like the letter "S"
- Φ, φ - pronounced like the letter "F"
Customs on tipping are different in every country. In Greece, you typically won't tip more than a few euros depending on the services. It is certainly not expected, but the general custom is to round up or say "keep the change." Below are the general tipping practices for each service in Greece. Restaurants: In most cases there is no need to add a tip at restaurants, though it is considered polite to round up the bill or say "keep the change." If a service charge is not included, then consider tipping 10%. Tipping is not expected, but always appreciated. Taxis: Add a few euros or tell the driver to "keep the change." Luggage handling is automatically included, so no need to tip extra in that regards. Hotels: Leave one or two euros for the room cleaning, offer one or two euros per bag carried, and one or two euros for helpful concierge service. Bars: Tipping is not expected. If the drink costs a difference of .50 euros you can say "keep the change," or if you have a few rounds of drinks you may leave a few euros on the table. It is not necessary, but a good gesture. Tour Guides: 10-15% of the tour price; or 5 euros for a half day, and 10 euros for a full day. Sometimes it is hard to know what to pack when visiting an unfamiliar country. Season, customs, and international policies are all things to take into consideration as you prepare for you trip. Here is a list to get you started on the essentials. Keep in mind that your passport must be valid for at least 3 months counting from your date of departure from Greece; 6 months is recommended. Currently, a visa is not required for stays less than 90 days since Greece is a member state of the Schengen Area. Starting in 2021, however, U.S. citizens will be required to attain ETIAS authorization to visit a country in the Schengen Area. The application can be completed online with a service fee of 7 euros (about $8), and the authorization will be valid for three years. Convert some cash to euros before visiting. A credit or ATM card with no international exchange fees is also useful to have along. Greece is compatible with the standard "Euro" plug, type C.
Plug types E and F will also work. Free WiFi is available in most places. You might consider trying an international SIM card as well; check with your phone carrier for pricing. Tap water in Athens is generally safe. Elsewhere, it's safest to stick with bottled water; usually cheap. Useful to have some easily packable bags for dirty laundry, beach days, hikes, souvenirs, etc. You never know! This guide that you're reading right now! - Checked luggage can weigh no more than 50 pounds (22-23 kg) per bag. - The maximum dimensions for a carry-on bag are 9 inches x 14 inches x 22 inches (22 cm x 35 cm x 56 cm), including handles and wheels. - Liquids over 3.4 ounces (100 ml) should be in checked luggage. - One clear quart-sized bag of liquids, aerosols, gels, creams, and pastes are allowed in your carry-on bag as long as they are in travel-sized containers that are 3.4 ounces (100 ml) or less. - Electronics can be carried on; anything larger than a cell phone must be removed from bag and placed in a bin for x-ray screening. - Make sure your name and contact information is attached to all important items. - If you use a baggage lock, make sure it is TSA-approved. - Security Screening: When going through security your pockets must be empty, shoes off, belt off, jackets off, and all belongings placed in bins for x-ray screening. Liquids and large electronic devices must be removed from carry-on for screening process. Since graduating from Bucknell University, Alana has been seeking out life as a nature and travel writer. With a thirst for adventure, she has traveled extensively through Greece for archaeology, Nepal as a volunteer, and much of the U.S. by road trip, seeing natural wonders of her native country. With every place, she keeps a writing and sketch journal to capture everything in the moment. She feels it is key to attaining the essence of what makes a place so alive.